I don’t know about you, but this summer I’m going to have over thirteen weeks where I have to entertain three kids who will be home from school. You’ve got to have something to keep them busy, right? How about a sewing project? Maybe these little seamstresses will inspire a future skirt sewing project. 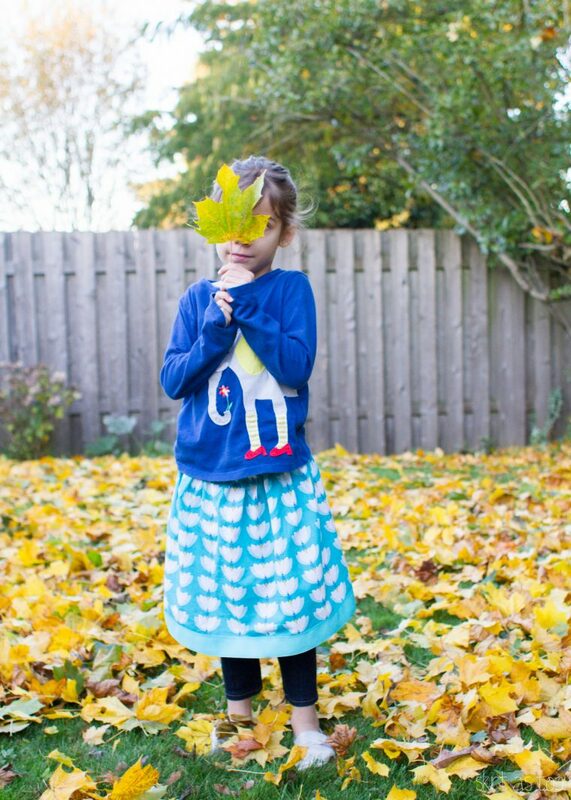 Clearly the thimble doesn’t fall far from the sewing machine because this Lazy Days Skirt was made by Liesl’s daughter S. This photo was already shared in our Starting Out With Oliver + S: Girl Patterns post which shares advice on where to start with beginner levels patterns. 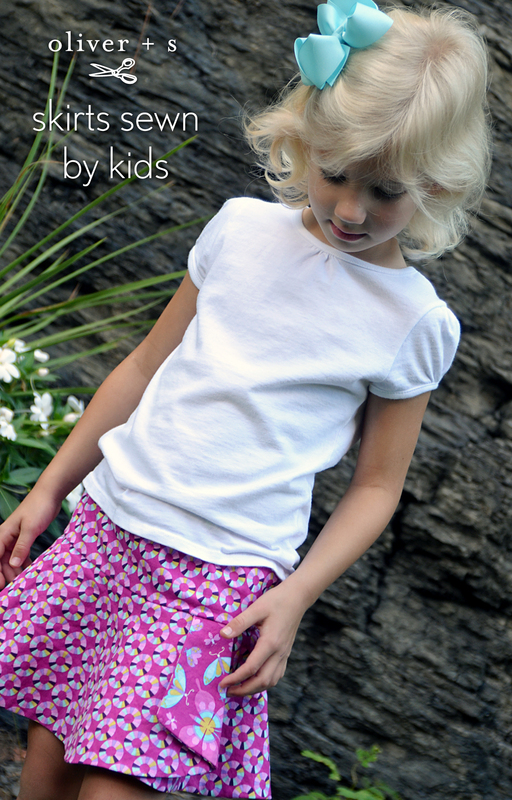 Now we have a few of our sewing friends to share their experiences with girls sewing Oliver + S skirt patterns. First up are the lovely Ashley and Emily. Here’s what they had to share. 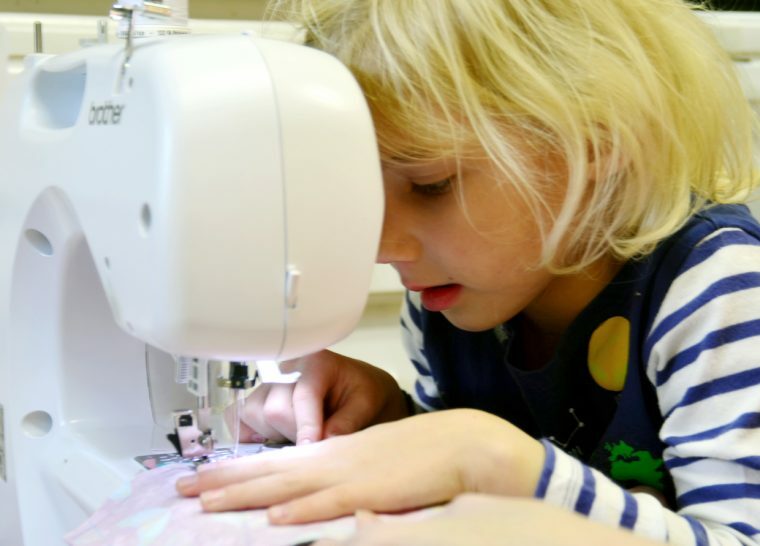 Sewing with children can be tricky–are we right?! You want them to express an interest with sewing in their own time, have ownership of the project through pattern and/or fabric selections, be successful in the said adventure, while getting as much “bang for the buck” for the time investment, expectations, etc. put forth on the project. At least this is what we were hoping to accomplish when we began a little sewing project with our oldest niece, EA. She had expressed an interest in sewing “on and off” for several months leading up to the adventure. 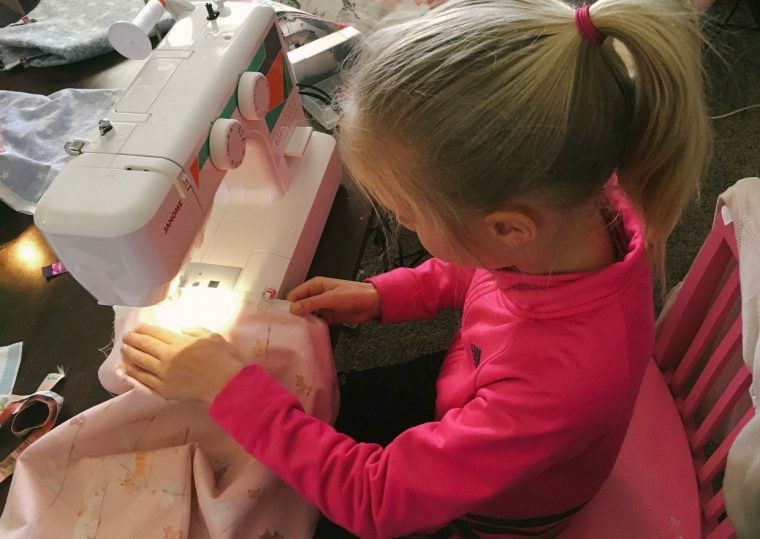 We had “prepped” her (so to speak) by giving her the opportunity to explore and experiment with a backup sewing machine, most importantly, one with a speed gauge. But, you can only “prep” for so long! So, a pattern was selected and a fabric shopping trip commenced. Remember that above mentioned list? 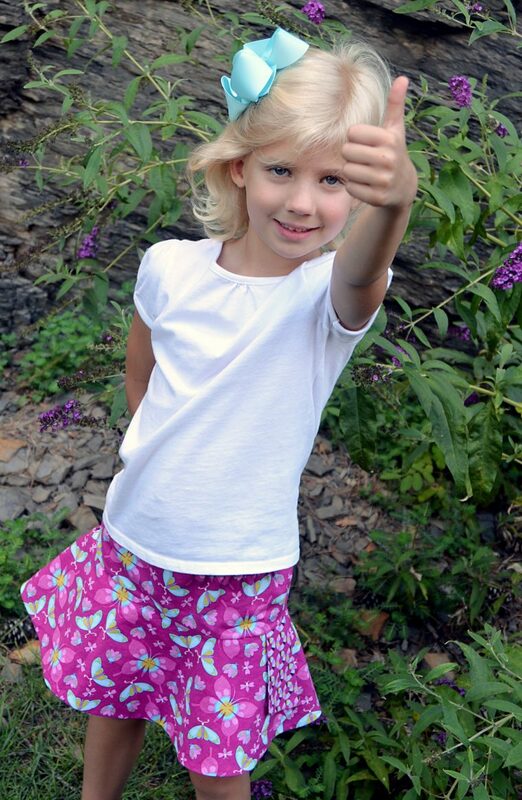 EA selected her fabric for this project, but we chose the pattern: the Hula Hoop Skirt, a reversible skirt! How’s that for “bang for a 5 year old’s buck”? This sewing project lasted several weeks, okay, maybe months! We never pushed her to sew, only doing so when she mentioned it (although we always had the next step prepared, and waiting in the wings). While she did the majority of the sewing, we handled the cutting, pinning, ironing, and any of the more intricate steps. Thankfully, skirts can be worn forever. So there was no harm in our pace. When she was finished sewing, she had two “outfits,” instead of one, due to the reversibility. We’d like to say, “strategic planning,” on our part! As for more sewing projects? We are waiting for the word. Immediately upon completing the skirt, she expressed an interest in sewing a dress. But, to date, she hasn’t pursued it enough to warrant pattern and fabric selections yet! Hopefully, there will be more sewing projects in our future, for her, as well as her younger two sisters. Next up we have Rebecca with her sewing day story. After talking about having kids over to sew several times in the last couple of years, we finally planned a sewing day! 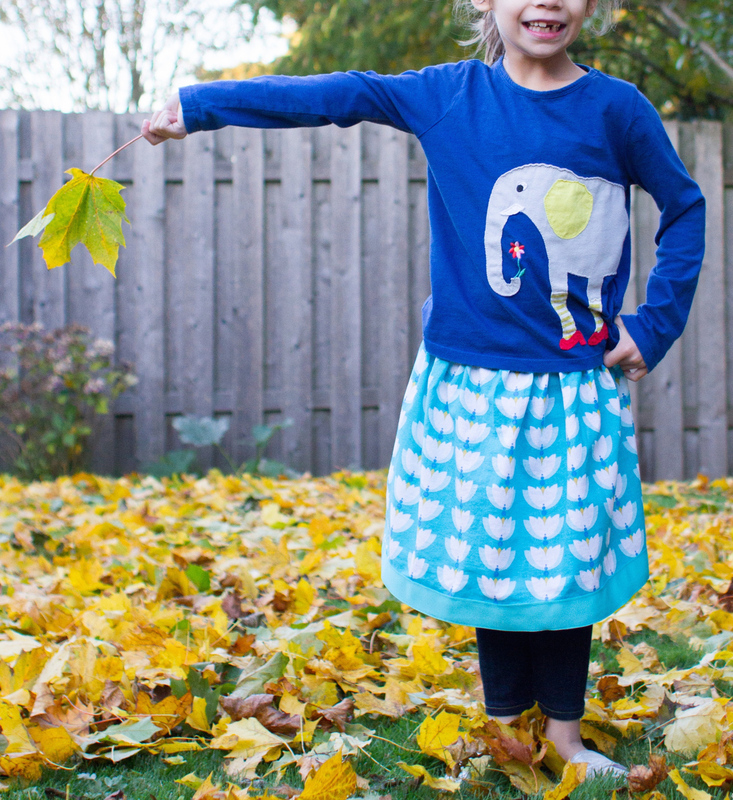 The obvious pattern choice for a day sewing with two nine-year-old girls, an eight-year-old girl, two six-year-old girls, and a four year-old-girl is the Oliver + S Lazy Days Skirt. 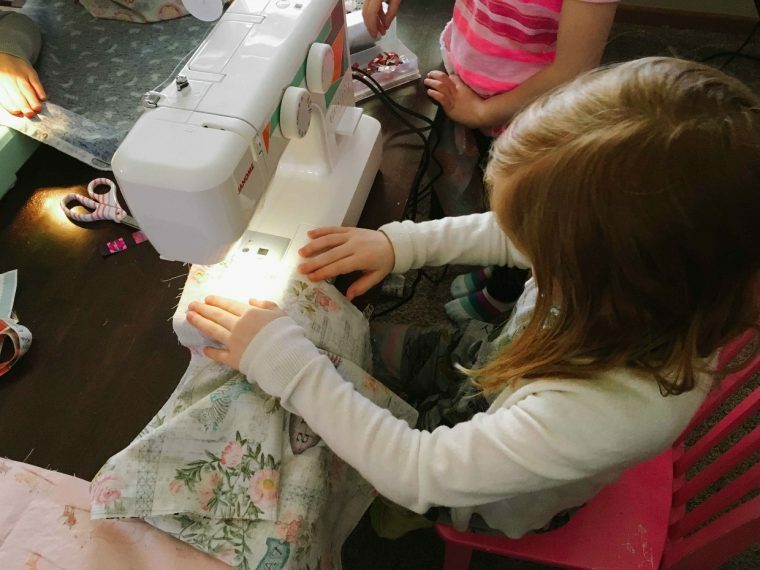 We decided to use my two daughters’ sewing machines and we rotated through trying to keep everyone pretty close to the same step so they would all finish around the same time. I had two moms there to help me out, so that we could be sure to keep things moving along. 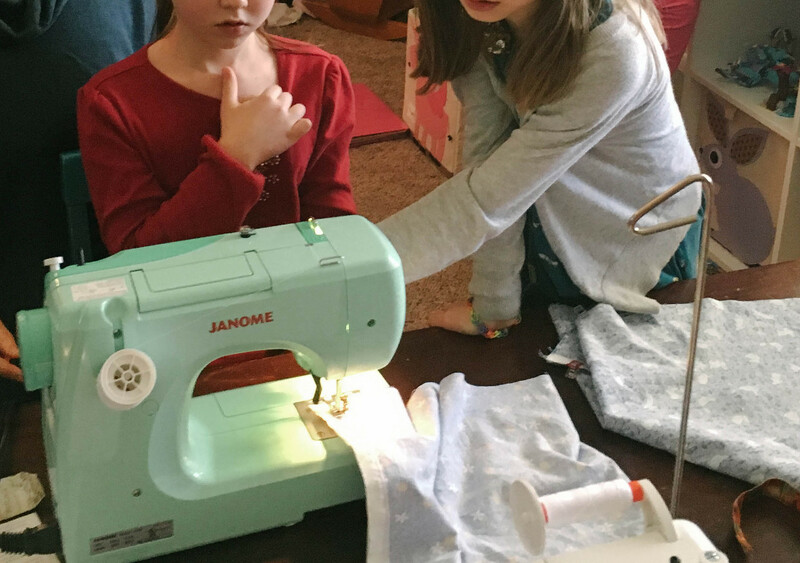 I assigned one to the ironing station to supervise/help the kids iron when necessary, and the other listened to my instructions and then would supervise one of the sewing machines for me. Since we had such a wide range in ages and experience, we had girls with different levels of comfort on the sewing machine. It was really fun to see my nine year old stepping in to help her friends a little! By the end of the day all of the girls clearly felt more comfortable with the sewing machine and were sewing in pretty straight lines! It was kind of a long day; our friends came over around 10:30 and we got started on skirts. We took a lunch break and I dealt with a bit of a bobbin issue on one of the machines, and then we got back to it after lunch. I don’t think we finished sewing until after 4:00! I think that my biggest surprise of the day was how long the ironing of the hem took! That ended up being our limiting step which really surprised me! All seven girls had a great time and wear their skirts often. They are all so proud of what they made and are ready for our next project. I had so much fun sharing my love of sewing with the next generation! Lastly, we’ll hear from Kristin. 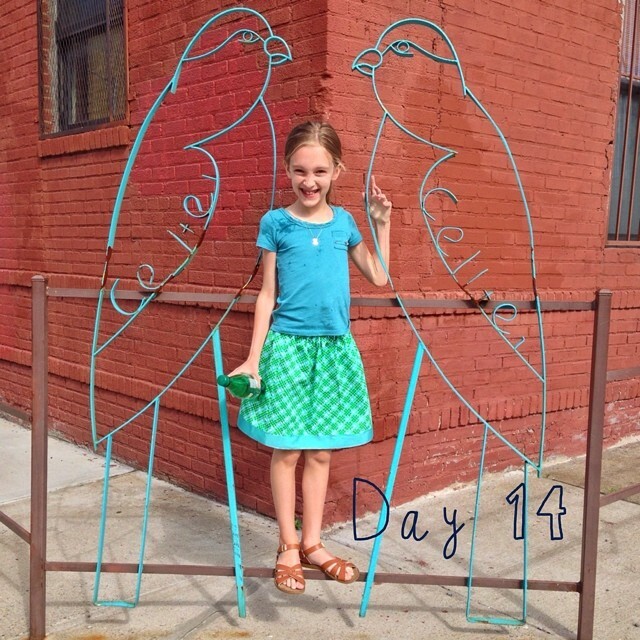 I had a lot of fun sewing this Lazy Days Skirt with 6.5 year old E. It was nice to slow down my own process and help her learn. I did the cutting and ironing (and the elastic waistband), she did the pinning and actual sewing. She gets so cute when she gets to do “grown up” stuff with me, she takes it very seriously and always tries very hard. We kept sewing sessions to short bursts because the going was slow and the focus was intense, and it stalled out for a few months, but we were both excited to wrap it up so she could wear it! This is so helpful! My 5 year old wants to sew, but I’ve had a hard time figuring out what parts he can really do. If I do the cutting and ironing, I think we’ll be good to go. Thanks for sharing.